Your Digital Afterlife was covered in several articles lately. Most notable was our feature in Raleigh’s News & Observer. It’s always fun to be covered by the local paper. Speaking of local, we were also interviewed on WUNC’s State of Things. While we were at SXSW, IEEE Spectrum mentioned our work in an article that was picked up by Discovery News, Forbes and several others. Evan Carroll will be at The Booksmith in San Francisco’s Haight neighborhood on February 24th at 7:30 PM to discuss and sign copies of Your Digital Afterlife. You can RSVP on Facebook or simply show up. We look forward to seeing you there. The Booksmith is located at 1644 Haight St. More details available at The Booksmith’s website. You can listen to the segment online. The Week “The last word: Your immortal cybersoul” did a nice piece about the issue. ReadWriteWeb posted “Obituary 2.0: Remembering the Dead, Digitally about 1000Memories that mentioned The Digital Beyond. A Dealmaker article “Emails from the Dead” featured our book and our video. Good to see the business community talking about the issue. 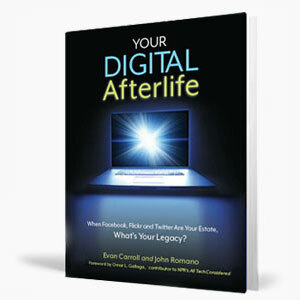 Authors Evan Carroll and John Romano will be at The Regulator Bookshop in Durham, NC on February 1st at 7:00 PM to discuss and sign copies of their book, Your Digital Afterlife. More information about the event is available at the shop’s website. The Regulator Bookshop is located at 720 Ninth St. in Durham. The Atlantic has published an excerpt of chapter 7, The Opportunity of Digital Legacy, on their website. Read the excerpt or a related piece, Facebook and Death: A Love Story. John and Evan have been featured in the news and have been talking about Your Digital Afterlife.